There are no two-sided arguments about how necessary networking is in today’s world. It is a pre-requisite if you have to succeed in your job or relationship. Education and your technical skills do matter, but what finally count in an organization are your conversational skills. For a matter of fact, you need to be vociferous about your career goals, your ambitions, your circle of people whom you know and how you benefit from them. Why Networking is so Important? It is the matter of truth that networking helps you to move ahead and make enhancements in your career. But let it be known that even though networking can help you a great deal in your career or business, there are more other important aspects from which networking can benefit you. Some people guide you both in life and job. You stay abreast of all the important happenings in your technical field. Your perspective towards life and job changes when you get to hear other people and their experiences. Well this is just a gist of the rewards of networking, but essentially its benefits are countless. Yes, you know that networking is the quintessential part of career building, but how do you go about starting a conversation with unknown people? As awkward as it may seem, but once you start a conversation, words seamlessly follows and you end up getting familiar to each other by the end of the conversation. So How Do you Start a Conversation? Isn’t ‘SMILE’ the necessary and compulsory ingredient of all the conversation starters? When you approach a person to start the conversation, have a beautiful smile on your face and then start with the talking and chatting. You cannot have a sullen look when you start a conversation. And the smile instantly provides that start and connection which is required for a successful conversation. And notice that a smile always immediately rewards you with a return smile which also signals that you can start a conversation with that person. These straight-forward and simple conversations work well with all kinds of people. Since these questions are easy to answer, expect simple and to the point responses from the people. And you don’t need any preparation or you don’t need to observe and judge people before you start your formal conversation. These can be used anywhere, anytime and to anyone. These are the orthodox formal conversation starters which will surely start the conversation but fail short of making a good initial impression about you. But once the conversation starts to flow, then it doesn’t matter how you started it. And know that not all people appreciate humor. Some people like to hear it straight and simple. Then this kind of conversation works well for them without you having to undergo any unpleasant situation. If you believe that you need to make a splendid first impression and that is your nature then go ahead with the witty conversation starters. Not only does it help to instantly start the conversation but it helps to make the person in front of you feel comfortable. The starters can range from being absurd, whacky, self-deprecating to an outright brag. But remember not to overdo it lest you risk the fall of your reputation. If all goes well then you will be cherished, but if the person is not the one who takes humor lightly then your image will be tarnished forever in their minds. So bear this in mind when you try to start off a witty conversation. Casual conversation is the least risky one and the safest one when you need to start a networking conversation. This will just do. You will neither be judged as the boring one nor as the highly interesting one. “I had a tough time commuting to this place due to traffic. I hope that wasn’t the case with you”. Casual isn’t it? But if you are not the risk taker and if that particular event doesn’t require you to think and prepare much about how you need to present yourself to the person in front of you, then go in for this type of conversation starter. And with casual conversations you will feel at ease to start the conversation and continue with it. 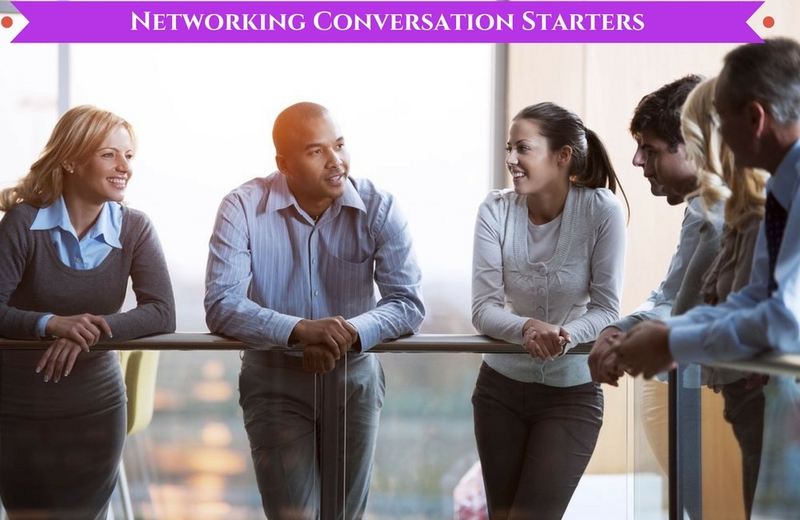 Networking conversation starters may be formal or casual or even witty, but then sometimes it may be related to professional or just personal. The type of conversation you want to start would definitely depend on the place and occasion not to forget that it would depend on the person also. Like, if it is a job related conference, then you wouldn’t take the risk of starting the conversation with something like “Hello. Would you help me about the night clubs here for I am new to this place?” So know how and when to differentiate between professional and personal conversations. “That is a great work you have accomplished. I admire you for the work you have done”. Remember that such conferences and meetings are places where you can collect awesome information regarding jobs and career enhancements. So don’t be shy when you need to start a conversation. Networking with individuals who are masters in their respective fields will give you an insight into how you can emulate their work ethics in your work and move ahead with it. When you are in an office party or office staff excursion, know that you have come out of the office zone and that this party or excursion is meant to relax and have fun. Then don’t commit the mistake of conversing with people about office related work when they are in no mood to. Conversation starters like “How did you go about achieving your business target?” will do no good. Keep the conversation starters as personal and casual as possible. Enquire about their family or their hobbies. “Your child is a genius like you”. “You are a lucky chap. You have a beautiful family”. “I noticed that you have an incredible taste in shoes and clothing”. Conversations like this peps up the mood of the person in the front and makes them relaxed to talk to you. After they are comfortable do notice that they themselves start enquiring with you about your career and job goals and start giving you valuable advice related to your technical or business field. The point not to be missed here is that if they start enjoying their personal conversations with you then you will benefit immensely from their good mood and such people are sure to help you further in your career goals. True. After the conversation starters it is of utmost importance that you keep continuing your conversation without making it lackadaisical or one-sided. If the person in front of you is experienced make sure that you are a good listener without unwanted interruptions from your side. Keep the conversations interesting by sharing anecdotes and decent humors and take care not to spice up the topics too much that the taste of the conversation gets lost in between. Isn’t that why you started a conversation in the first place? Certainly, networking conversations are not meant to be a one day affair. You never know when such people will be of help to you. So it makes sense to remain in touch with people through networking sites or sometimes an occasional call will do the trick. And when you meet them personally the next time, do strike conversations from where you left the last time. Do enquire about things you got to know from them in your first conversation. This will help in building a trustworthy and an enduring relationship. Not all are born with a flair for conversations. It takes time for introverts especially to strike up interesting conversations. For some socializing comes naturally but others can be a pro in conversations after attending networking parties and trying to make the most of it. Of course, one tends to feel awkward in the beginning. But then gradually you start and get to know how to strike meaningful conversations by observing others and more than that by learning from your own experiences. So never be shy to network or never run away from conversation starters. Always know that someone else is also waiting to strike a conversation with you. So then why not do the honors yourself?